Snow showers will clear on Sunday night, leading to a sharp fall in temperature and ice. Commuters are being warned to prepare for rush-hour disruption on Monday as ice is expected to cover much of northern Scotland. The snow currently affecting higher ground is expected to clear on Sunday night, leading to a sharp fall in temperature and a covering of ice on roads in the area. 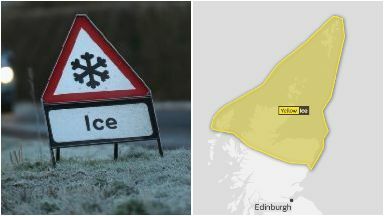 The Met Office has issued a yellow "be prepared" warning for ice in northern Scotland, and travel disruption during Monday morning's rush-hour is expected. Drivers are being warned to take "extra care" when using the roads and avoid travelling if possible. The areas most at risk are Aberdeenshire, the Highlands, Orkney and Shetland. A Met Office spokesperson said: "A showery band of rain and hill snow will clear the Scottish mainland on Sunday night with clearing skies leading to a sharp fall in temperatures and some ice. "Further wintry showers will follow across the Northern Isles and into the far north of Scotland, these falling on to sub-zero surfaces and maintaining icy stretches into Monday morning."